Ordinary grey concrete has been used for domestic driveways and patio surfaces as well as commercial areas for decades because it is relatively easy to lay, durable and inexpensive. Tarmacadam has also been used, for the same reasons but whilst tarmacadam has been criticised for being plain and unattractive, ordinary grey concrete excels even tarmacadam in this respect. As a result, manufacturers and contractors have explored ways of making concrete look more attractive and what better way than to disguise it as something more natural? On other pages of this website we will examine the different colours and patterns of pattern imprinted concrete, the advantages and disadvantages of pattern imprinted concrete, how to clean and reseal imprinted concrete. We also look at how pattern imprinted concrete is installed; with a checklist for householders and the five most important points to be aware of in a pattern imprinted concrete installation. Pattern imprinted concrete, abbreviated to PIC, is also referred to as patterned concrete, stamped concrete or textured concrete and is essentially high strength concrete which has been coloured and formed to appear like natural products such as stone, cobbles, slate, brick or even timber. In North America, where pattern imprinted concrete is referred to as stamped concrete, concrete has been coloured and stamped since the 1950’s to create a more aesthetic surface for driveways, patio areas, foot paths and swimming pool surrounds. Visitors to America brought the idea of stamped concrete back to the United Kingdom in the 1980’s and renamed it pattern imprinted concrete. Initially all consumable products which are required to transform the appearance of concrete into more natural paving products (such as the printing mats, colour surface hardeners, pigments and sealants) were imported from the USA but eventually manufacturing plants set up over here. After a slow start, pattern imprinted concrete has grown in popularity though it still trails block paving and tarmacadam as the surface of choice for most homeowners’ driveways. Installing pattern imprinted concrete is not really a Do It Yourself project. Not only because of the skills required in creating an authentic reproduction of the colours and patterns of natural stone products but also because it requires specialist tools in order to achieve a credible and durable finish. It cannot be emphasised how important it is for a homeowner wanting a pattern imprinted concrete driveway or patio area, to choose an experienced and reputable contractor / installer. Too many poor quality installations have led to pattern imprinted concrete being sometimes referred to as a Marmite™ kind of product as you will either love it or loathe it. Brochure and website images of driveways and patios finished with pattern imprinted concrete sometimes appear shiny and artificial. This is because contractors have often photographed the surface immediately after completion, when the sealant has either not been allowed to dry or has not yet lost its sheen, and the wet look creates an unrealistic finish. Equally, poorly printed concrete doesn’t look like natural stone – it looks like poorly imprinted concrete. As a result, many people are of the opinion that pattern imprinted concrete fails in its attempt to replicate the appearance of natural stone, slate or brick. 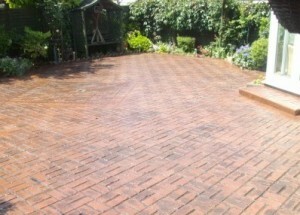 However, it is possible to get a well-constructed pattern imprinted concrete driveway or patio area, which is properly installed, printed, coloured and sealed, providing it is carried out in good weather conditions by an experienced contractor who takes pride in his work. When this is achieved, the results can create excellent reproductions of natural surfacing materials at a fraction of the cost. Consequently, most specialist pattern imprinted concrete installation companies not only refuse to offer alternatives, but claim that the only reason any homeowner would choose an alternative such as block paving or tarmacadam – is cost. As regards the cost of driveway and patio surfacing materials, the simplistic view is that tarmacadam is the least expensive, then concrete block paving, with pattern imprinted concrete the most expensive. The truth however, is that the price of each of the three will cover a wide spectrum which overlaps the next product in the pricing hierarchy, though the cost per square metre of each of them will generally fall as the size of a job increases. As with all home improvements, the price of any job is mostly dictated by the quality and cost of both the materials and the labour and the required profit margin of the installation company. Taking the full installation cost of an average size driveway, say 60 to 80 square metres, we have seen quotations for tarmacadam ranging from £50 to £80 per m², concrete block paving from £60 to £120 per m² and pattern imprinted concrete from £70 to £150 per m². In addition, most paving contractors will have minimum order values as the necessary time gaps between some of the processes involved require more than one site visit, even for the smallest of areas to be paved. 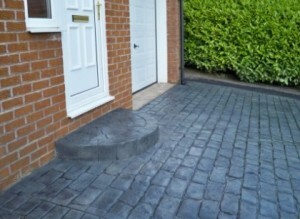 Due to the fragmented nature of the paving industry, with most installers working from home, many quotations are prepared either by the owner of the business or a surveyor. The pattern imprinted concrete arm of the domestic paving industry has in recent years however seemed to be the first to be affected by the high pressure sales tactics of the direct selling industry and, as with the PVCu window and door industry, the price you are first quoted is very often discounted heavily in order to clinch the sale. This is not true of all pattern imprinted concrete installation companies but it does mean there could be substantial savings to be made by negotiating with some of them. Just a Quote can help you to choose an experienced and reputable pattern imprinted concrete installer, without paying over the odds. By far and away the largest market for pattern imprinted concrete in the UK is for domestic driveway and patio areas; however there is a limited commercial market as it is not entirely suitable for roads and other areas subject to heavy vehicle use. Pattern imprinted concrete has successfully been installed for pedestrian areas in shopping precincts, around fast food restaurants and at theme parks. It has also been used on film sets, for example, where an old Victorian street scene with a cobbled surface may be required for a film scene fairly quickly.